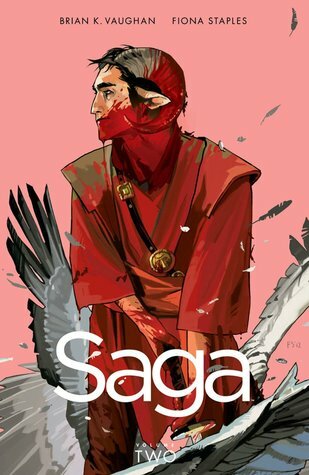 I picked up Saga Volume 2 shortly after finishing the first one. I’m really captivated by the series, but I’m starting to sense that we’re not going to get anywhere really fast because this graphic novel doesn’t move us really farther on than we were. However, I’m enjoying the trip, which is a good thing. 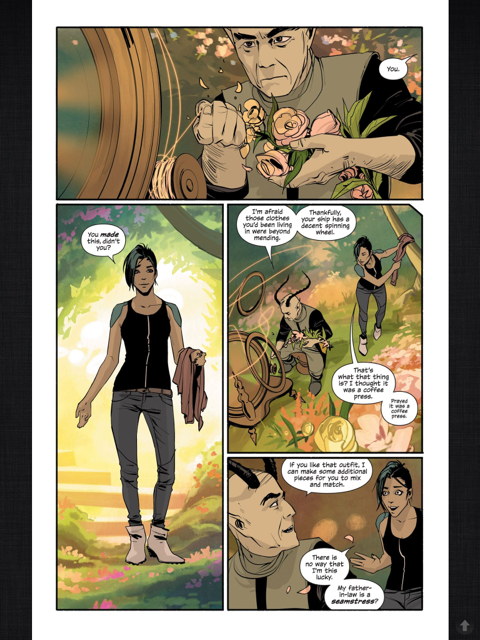 The characters Brian K. Vaughan and Fiona Staples bring to their creation is awesome. I kept getting caught up in all the interplay and the machinations. Normally a cast this large would be a challenge for readers, but each of the players is drawn so well that I have no problem keeping up with who is who. Of course, the fact that Vaughan and Staples don’t mind killing off major players keeps those numbers down somewhat. And I want to kick and scream when they do that. Often I’m not done with those characters and want to see them more. That’s certainly the case in this volume. Case in point: the mouse medic. I’m going to warn you now not to get too attached. You’ll want to, and then you’ll just get your heart broken. I honestly don’t know where this series is going. Haven’t got a clue. But I know that somewhere out there, this baby grows up. I just don’t know how many people (or if) anyone survived with her. I mean, she’s already attached to a ghost, so maybe they’re in limbo somewhere just talking to each other. Vaughan’s sense of characters is amazing. I loved the way the romance kindled between Alana and Marko, and I love the resonance that echoes in Marko’s parents. It’s easily seen where his romantic nature came from. 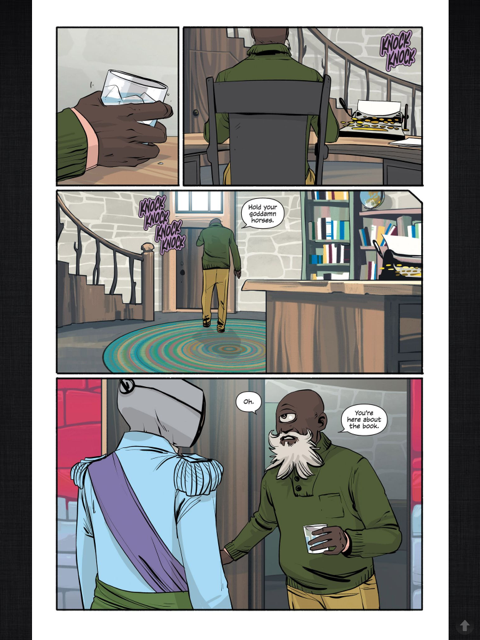 It’s hard to talk about the plot without giving things away (like the above mentioned mouse medic), but I will say that this comic series is definitely one that will entertain and expand horizons. 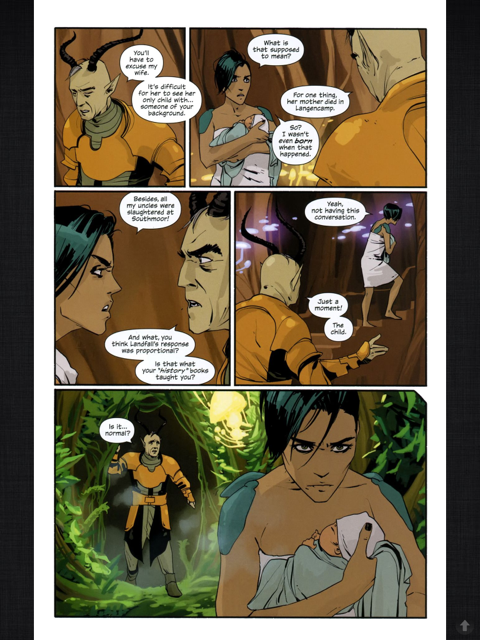 As I mentioned before, Saga is definitely an adult comic. This entry was posted on July 26, 2013 at 5:36 am and filed under Adventure,comics,ebook,fantasy,Graphic Novel,series fiction,SF. You can follow any responses to this entry through the RSS feed. You can leave a response, or trackback from your own site.